Need more room, be sure to also reserve the Balcony Suite. This house is even more lovely (and cozy) than the photos show - gorgeous art on the walls, lovely furnishings, big bright windows and a breezy front porch. The location is prime - close to our favorite night spot and several great breakfast spots. Thanks also for the breakfast coupons! 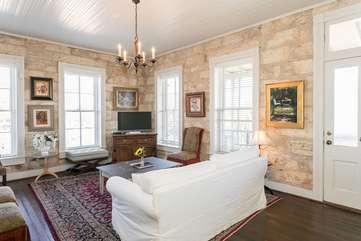 This place is perfect for a weekend in Fredericksburg!! The house is SO nice and is walking distance to all the Main Street has to offer!! Highly recommend!! We enjoyed staying in this charming, cozy suite so much! The suite is very comfortable and was furnished with everything we needed and the walls are decorated with gorgeous artwork! We just felt right at home. The location is absolutely perfect and the hosts are so nice and friendly. We will definitely stay there again the next time we visit Fredericksburg! Great property, great location, checking in was seemless. Would be glad to come back! Quaint and comfortable. Great location. Old charm and perfect location! This place is a gem! Stone wall, beautiful art on the walls, wrap-around porch with view on Main street, a little patio with a fountain, comfortable bedding! It was lovely! The place is located on Main street, so park your car (off-street parking included) and walk to the winery across the street or go shopping! So very convenient!! Upon booking you will receive an email with all the instructions needed. Upon checking in, we received our vouchers: to be redeemed at our choice of about 7 restaurants in Fredericksburg for breakfast (or lunch) including the German bakery right across the street! Also included some coupons for local stores and a lit of activities going on in Fredericksburg that week. Everything was so well thought about! The kitchen is not your typical rental place kitchen: very nice assortment of plates and glassware. They have a Keurig with very nice assortment of coffee + tea bags! The choice of pots/pans/cooking dish was however somewhat limited so I had to get a little creative to cook what i had planned, so don't plan fancy cooking or bring your own pan! This was the only cons. Everything else was just PERFECT! Would definitely recommend and would most likely come back! This little gem is right on Main Street and in easy walking distance to galleries, boutiques and eating of all kinds. Every detail was tended to and our dog loved it, too! When we ran low on K-cups, iasked Shannen where to purchase more but she replenished our stock immediately. We will definitely be back!! Clean, cozy, and homey! The perfect location to any and all parts of Fredericksburg! The method of obtaining the key was easy, the decor and amenities could not have been more perfect! I will be back! I miss drinking coffee in the courtyard and listening to the fountain. I loved the balcony that overlooked Main street and people watching! I love curling up on the couch and resting too. My neighbor and I went for a wine tour and had the most relaxing vacation! Thank you! What a treasure to find this place! It was SO clean (even my Mom would have approved :) and comfortable! Beautiful exposed brick, lovely paintings and comfortable beds. It is in a great location and within walking distance to everything on Main Street. I would definitely recommend this to anyone looking for a welcoming place that is right on Main Street. We will be back! We thoroughly enjoyed our stay and we look forward to returning. Location is excellent. The host provides every amenity we could have wanted. Clean, beautiful decor and very comfortable. The street noise is only a minor nuisance, if you are a light sleeper. Great walkable location off of Main Street! Very cute unique bed and breakfast experience!